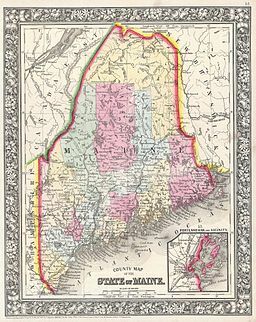 Digitized historical papers from counties across Maine. Alphabetical list by county and newspaper title. Not comprehensive, but the project is ongoing. Created by the Portland Public Library, the Maine News Index Online is a database of Maine newspaper and magazine citations and abstracts. The library's Portland Room, which houses special collections, maintains a web page listing titles indexed. Index to and full text coverage of five Maine newspapers: Bangor Daily News, 7/1/1993-present; Kennebec Journal (Augusta), 8/21/2005-present); Portland Press Herald, 9/30/1995-present; Sun Journal (Lewiston), 1/26/2006-present; Morning Sentinel (Waterville), 8/21/2005-present. Selected business coverage of the Maine Times (2/4/94-4/25/02) is also included. There is selective coverage of some earlier years, and some gaps in the coverage listed above, for these titles; consult the ProQuest title list for more information. Updated daily. Full-text, keyword-searchable image database of U.S. and international newspapers. Access is restricted to computers located within Fogler Library. Many Maine newspapers are available on microfilm in the Government Documents and Microform area of the Fogler Library. They can be viewed in the library on the first floor. Special Collections houses paper copies of some Maine newspapers in the Library Annex. These newspapers can be made available for researchers with advance notice of one week. Because of the fragile nature of most papers, photocopying is generally not allowed. In many cases, the holdings include only a few scattered issues of a particular newspaper. Please call ahead to be sure the issue you are looking for is here. For holdings of current Maine newspapers check URSUS. Project by the Maine State Archives to list newspaper holdings throughout Maine. Accurate as of 1999. Find Maine newspapers and where they are held.